If you’re in the market for a new water heater, consider upgrading to a tankless water heater. Unlike traditional tank-style water heaters, tankless water heaters do not waste energy keeping water warm when you aren’t using it. Instead, they only heat water as it is needed. This results in considerably lower energy bills. In time, a tankless water heater can even pay for itself. If you’re considering a tankless water heater in the Rochester area, trust GT Campbell Plumbing for fast, dependable service. 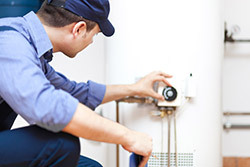 Whether you need water heater repair in Rochester NY or you’re just thinking about making the switch to a tankless water heater, there are numerous benefits. Energy Efficiency. Because tankless water heaters only heat water when it is needed, they don’t waste energy keeping stored water warm. When you turn on the tap, your tankless water heater will go to work heating the water you need. In addition to conserving energy, this type of water heater won’t run out of hot water in the middle of a shower. Compact Size. A traditional tank-style water heater has a large footprint and takes up a lot of space in your home. While a standard traditional water heater can be up to 60 inches tall and 24 inches in width, a tankless water heater is only about 20 inches wide, 28 inches tall and 10 inches deep. Longer Lifespan. A tankless water heater lasts up to 20 years while the lifespan of a traditional water heater is just 10 to 13 years. Though tankless water heaters cost a bit more upfront, their extended lifespan and improved energy efficiency make them more cost effective in the long run. In fact, a high-quality tankless water heater can pay for itself in time. For tankless water heater installation in Rochester, trust the best plumber in Rochester NY GT Campbell Plumbing. To learn more, give us a call now.